Great Wall TV Pack – $14.99/mo. Phoenix Pack Add-On – $5/mo. PRIMARY CHINESE LANGUAGE TV PACKAGES. *BASE DISH PROGRAMMING PACKAGE REQUIRED. Chinese: Great Wall TV Pack – $14.99/mo. With a plethora of channels broadcasted 24 hours a day–including top quality entertainment channels, provincial channels from mainland China, and additional channels from partners beyond China–the Great Wall TV Package from DISH expands your access to Chinese news, sports, and culture! To order the Chinese: Great Wall TV Package, contact your friendly DISH representative today. Chinese: Elite Pack – $19.99/mo. 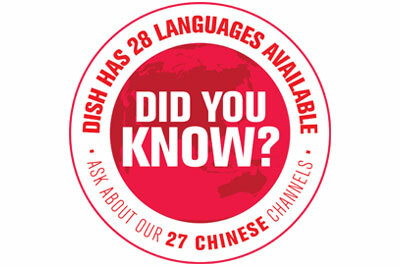 Top Chinese mainland channels are made readily available in the Chinese Elite Pack from DISH. Experience the viewing pleasure of the latest news, most popular dramas and movies, and the best variety and entertainment shows–all broadcasted in the Chinese language–with this great international package! To order the Chinese: Elite Package, contact your friendly DISH representative today. Chinese: Phoenix Pack (ADD-ON) – $5/mo. The Phoenix Pack from DISH brings you top programming from Hong Kong, including world news, financial reports, and plenty of entertainment. To order the Chinese: Phoenix Pack (ADD-ON) Package, contact your friendly DISH representative today. Chinese: TVB8 (ADD-ON) – $5/mo. To order the Chinese: TVB8 Pack (ADD-ON) Package, contact your friendly DISH representative today. Chinese: TVB Drama (ADD-ON) – $5/mo. TVB Drama delivers many beloved TVB drama series in Chinese or with Chinese subtitles. Viewers can now dive into the wondrous TVB drama realm by watching series Marathon style. To order the Chinese: TVB Drama Pack (ADD-ON) Package, contact your friendly DISH representative today. Chinese: Family Pack (ADD-ON) – $5/mo. The Family Pack from DISH features wholesome Chinese-language programming the whole family–babies, children, and adults–can enjoy! To order the Chinese: Family Pack (ADD-ON) Package, contact your friendly DISH representative today.